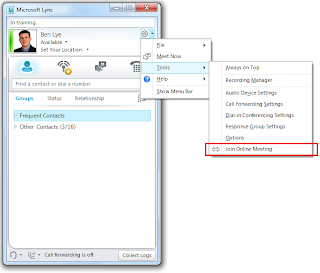 Joiny use Exchange Web Services Managefd API to make EWS calls to Exchange to enumerate any Lync online meetings, then displays a dialog allowing you to select and join a meeting. To achieve this Joiny requires that the SIP address is the same as the Exchange email address. I am not a software developer. Writing Joiny was a learning exercise for me, and I had to figure out how to use languages and tools that are not my forté. I make no guarantees to the quality or efficiency of the code - I have no doubt that there are still a few bugs to be worked out. 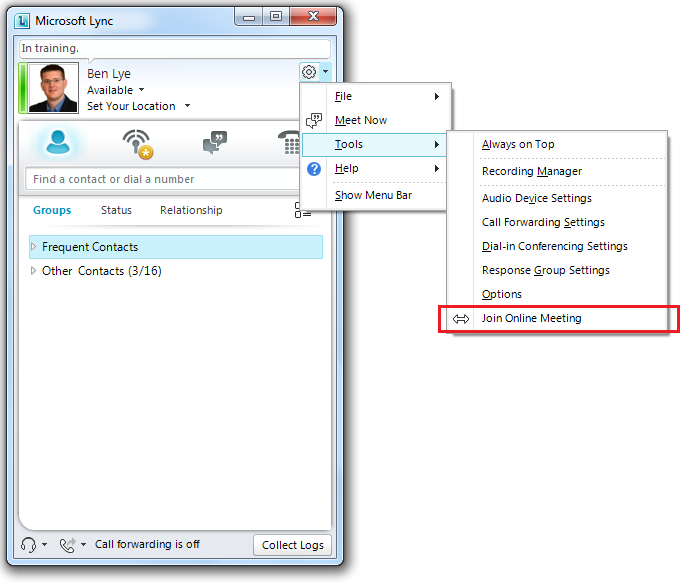 Once installed, you will get a new "Join Online Meeting" option in the Lync Tools menu. 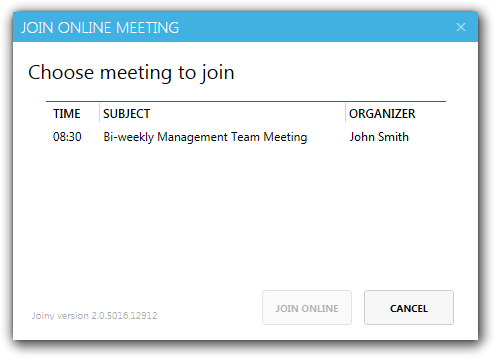 Clicking this option will launch Joiny, which makes some EWS calls then presents the Join Online Meeting dialog box. The dialog box will take several seconds to appear while the EWS process occurs. Once you select a meeting and click Join Online your browser will be used to launch the meeting URL and join you to the meeting. At the moment Joiny requires a direct connection to EWS - it won't work using Outlook Anywhere. It may just be my environment, but I've had trouble getting authenticated EWS calls to work via our TMG reverse proxy. I believe should work, but I haven't had time to really dig into it. If there is enough interest I might be able to spend more time on it. Likewise, if someone with more time and better knowledge of writing C# WCF apps is interested in getting into the source code and making improvements, I'd be more than happy to share it.